Burg Simpson, a Phoenix personal injury law firm, represents anyone who has suffered a catastrophic injury. We have over 40 years of experience fighting for victims’ rights to compensation. If you or a loved one has suffered a catastrophic injury, fill out a Free Case Evaluation form or call Burg Simpson in Arizona at 602-777-7000 to speak with a Phoenix accident lawyer. Any number of activities can lead to a catastrophic injury. Whether it is a car accident, a fall from a ladder, or a birth injury, the potential for catastrophic injury surrounds our everyday lives. But, according to the National Center for Catastrophic Sports Injuries, three sports activities are particularly deadly. Football: Youth football players face the highest incidence of traumatic brain and spinal cord injuries, sending roughly 62,000 kids to the hospital every year, most often with concussions. Cheerleading: While not technically a sport, cheerleading is particularly dangerous for the half a million cheerleaders who participate every year. Falls send about 37,000 cheerleaders to the ER annually. While not all of these injuries serious or life-threatening, cheerleading is still the second leading cause of catastrophic injuries for all high school athletic activities. Ice Hockey: Despite all of the hard-hitting action that takes places in ice hockey, slips and falls account for more injuries in hockey, while concussions make up about 13 percent of the sport’s injuries. If a family member has been seriously injured in an accident, get in touch with an Arizona injury lawyer as soon as possible by calling our Burg Simpson Arizona office at 602-777-7000. If you or a loved one has been seriously injured in an accident because of someone’s negligence, call a personal injury attorney in Phoenix at 602-777-7000 today. Most catastrophic injuries leave a lasting impact on your life and your family. Physical therapy can take years, and the pain can last a lifetime. Sometimes, a return to anything resembling a normal life simply is not an option. If someone’s careless behavior led to your catastrophic injury, you need to talk to an Arizona personal injury lawyer who has spent decades working with these kinds of cases. 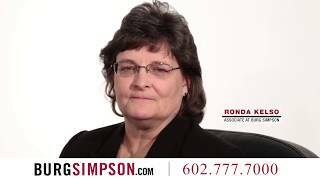 Contact Burg Simpson at 602-777-7000 or complete our Free Case Evaluation Form here. Please fill out the case evaluation form below and Submit Now, or call Burg Simpson directly at 602-777-3311 today, to speak with a Personal Injury Attorney. 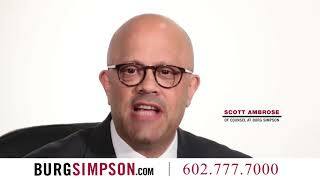 Burg Simpson Is About Changing Lives For The Better – That Is What We Do.